Try Continuous Ink System with your Brother MFC-255CW and make 30 times more quality prints for the same money! Pay only 0.04 USD for A-4 full color print! Ink System for Brother mfc-255cw: What is it and what for do you need it? What is CISS for mfc-255cw? Because of the fact, that the competition between the major manufacturers of plotters and MFDs, including Brother Company, was growing, more and more all these manufacturers began to reduce the price of their printing devices, in order to get the user's choice. But at that, to make a profit, these companies keep very high prices on the original cartridges and ink and reduce the capacity of cartridge itself. For the moment, they reduced it to an absurdity. 8 ml of ink in original cartridge could cost up to 18-20 dollars. It turns out, that 1 ml of ink costs 3 dollars, with the assumption that gold could cost 7-9 dollars per gram. And so, you get ink almost at the price of gold! After all, when you choose the printer model, you could buy the model, which you liked most of all. But if you want to purchase original consumable materials, only original manufacturer will offer it to you. This situation led to the fact, that you could buy more or less qualitative printer for 50 dollars, but 4 cartridges for it will cost 40-45 dollars. Precisely this situation led to the introduction of alternative consumable materials. The license cartridges, ciss brother mfc-255cw and refilled cartridges are among them. What are the alternative consumable materials? The license cartridges are the cartridges, which repeat the shape of original ones. They have the same capacity and most of them are expendable. The refilled cartridges are also similar to the original ones. They also have the same shape and capacity, but they easily could be refilled by users. The continuous ink supply system (ciss mfc-255cw) is a power-reservoir system, as well as the same models in the class ciss for brother mfc-6890cdw and ciss for brother mfc-5890cn. It is meant for ink supply from donor tanks to printer's cartridges according to its consumption. From cis brother mfc-255cw to printer's cartridges ink runs through the elastic tubes (it's a kind of loop), that connect printer's cartridges and ink tanks. Due to the generated vacuum in the tank, ink from tubes replaces consumed ink during printing process. The installation of ciss ink system brother mfc-255cw allows users to save considerable percentage of their money during inkjet printing. 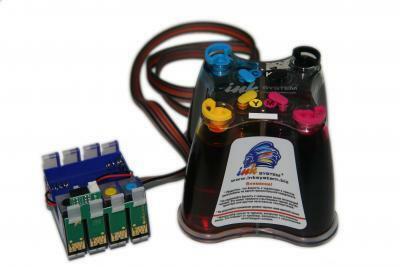 The device consists of special reservoirs, which are connected to the original cartridges via a silicone loop. The steady ink flow from the cartridge of your printing device to the printing head goes on through it. The continuous ink supply ciss for brother mfc-255cw helps you to raise savings level by 30 times, in comparison with the usage of original cartridges.